This review covers the Xbox 360 and PC versions of the game however from what I have heard the PS3 version is essentially the same. I tested this game from my perspective as an experienced guitar teacher then gave it to a family member with no guitar experience to see how it would work for a complete beginner. 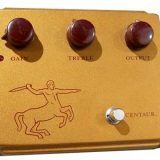 So in this review, you will find out how the game feels whether you’re new to guitar or already play. There are quite a few different features within this game so here’s a quick overview of the different modes. Check out the full details of Rocksmith 2014 here. This is the main aspect of the game – to learn how to play songs. Rocksmith 2014 comes with just over 50 songs and many more are available to download as extras. The initial list of songs covers a very wide range of styles so everybody should be able to find plenty of songs to their liking. I have memories of questionable songs included in Guitar Hero so I was pleasantly surprised when the list of songs loaded up for me. These are actually songs that guitarists would want to learn on guitar so it really seems like the Rocksmith team did their research (see the list of songs here). Once you select a song you want to learn, you are presented with a few options. 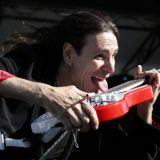 You can take some lessons to help you learn specific techniques used in the song, you can play the song, practice specific sections of the song or even attempt playing the song at different skill levels. The first song I loaded up was a song I already knew how to play. I wanted to see how the game displayed the song and to see how it compared to the version I learned from guitar TAB. I was a bit disappointed that in the first 30 seconds of the song I was asked to play only 4 or 5 single notes. This is because the game adapts to your playing so it starts out by creating a very basic version of the song first and gradually introduces more notes as you improve your accuracy. This is a fantastic feature for a beginner as you will be able to play through the song straight away and gradually work towards the real guitar parts. For an experienced guitarist, it can be a bit frustrating at first because you’re so used to playing the real parts that it feels strange to play only selected notes out of the riffs. Eventually, the game noticed I was hitting every note accurately so it gradually started introducing more and more notes. It took quite a few repeats of the song before it started to show the full parts. The Riff Repeater option allows you to learn difficult sections of the songs by slowing the track down and repeating it while gradually adding extra notes as you improve. This is an essential feature for beginners and as a guitar teacher, I highly recommend you spend time using the riff repeater. You will memorize the different riffs faster if you use the Riff Repeater so use it regularly whenever you learn a new song. This is a great addition to the game that allows you to jam with a band. Intermediate guitarists first learning to improvise will find this very useful. You choose the instruments you would like as part of your band, choose the key and can adjust the style and tempo. Once you get started Rocksmith 2014 will listen to your playing and adjust the accompaniment to match what you are doing. So if you start playing with more intensity, you will hear the rest of the band pick it up. This works really well and doesn’t just feel like you’re playing to a set backing track. Rocksmith handles this mode very well and it’s a fantastic way to develop your improvising skills. The relevant scale is displayed on a fretboard so if you’re still learning the scales you can use it as a guide to find the right notes. It also allows you to shift up and down the fretboard to different positions which is a great way for beginners to break out of the box Pentatonic shape. If you’re new to guitar, the session mode won’t make much sense to you yet. Stick to learning songs and when you reach the point where you feel like you want to learn how to improvise, check this mode out. If you’re an experienced player, the session mode is a very easy way to practice using different scales or improvising with different styles. Notice the fretboard diagram above? The scale shown is the E Blues scale. You may notice that the fretboard diagram is upside-down compared to normal. This can be confusing so fortunately you can invert the fretboard in the options menu. This mode allows you to create a setlist of songs to play. This mode would suit people who have already mastered the songs and just feel like having a play for 10 or 20 minutes. At first, you won’t have much use for this mode but after you learn quite a few songs you can use this mode to play your favorites. This is where Rocksmith 2014 stops being a game and becomes an essential learning tool for beginners. The game really is focused on helping players develop their skills and this mode shows how dedicated Rocksmith is to actually learn guitar. This is an interesting mode that uses retro arcade style games to teach players certain skills such as strumming, scales, chords, etc. As a guitar teacher, I know how students are often put off by skill exercises or drills, so seeing these exercises presented as mini-games will be a sigh of relief for any beginner. If you are a beginner I recommend you regularly spend some time working through these games. You will find that you will be able to learn songs faster and you will find it easier to find the right notes on the fretboard. Most people probably won’t dive into the multiplayer or online features of the game because most of the time will be spent learning songs and jamming. But it is available if you have a friend you want to ‘jam’ with. When first loading up Rocksmith 2014, you are asked a few questions such as your current guitar skill level, if you’re left or right handed and a bit of information about your guitar. 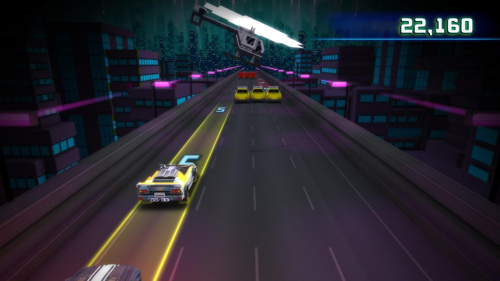 The game adjusts the features and experience based on your answers to try and match itself to your current abilities. That means that a complete beginner will start off with a very different experience to an accomplished guitarist. As a very experienced guitarist, I quickly realized I was going to have one big challenge with this game: the note highway. I can sightread standard notation and guitar TAB – but the note highway used in this game is very different from normally written music for guitar. In many ways it makes a lot of sense – shifting up and down the neck matches what you see on the screen and the fretboard shown is sort of like looking through the back of your guitar’s neck if it were transparent. But in a lot of ways, it isn’t intuitive to somebody who already reads music. For anybody who is used to guitar TAB, everything will look upside down. I tried to stick with the default setting for a few song repeats before giving up. Fortunately, you can easily invert the fretboard in the Options menu. I highly recommend experienced guitarists invert the fretboard as it will make the experience a lot easier in the beginning. For a beginner, the note highway will make perfect sense and you will find it easy to understand where to place your fingers on the fretboard. For example, each string is displayed with a different color and the little blocks will tell you which fret to play. The blocks even tell you which fingers to use to play the notes so you have all the information you need. It won’t take long to understand this way of presenting music and it will eventually feel natural. Unfortunately, this means when you later go online and download some guitar TABs, everything will look upside down. 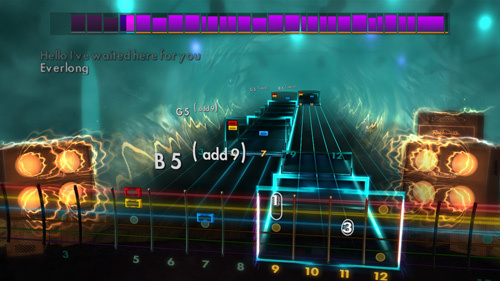 This is one of the only problems I have with this game – by using the note highway and flipping the fretboard over (compared to guitar TAB), Rocksmith is creating an additional way to read music that doesn’t work outside of the game. Once I inverted the fretboard I wanted to see how easily I could learn a song I’ve never tried before. So I selected a song and chose the ‘Score Attack’ option which lets you try to take on different skill settings. I selected the highest option and let the song load. The fact that I failed halfway through the song shows how dramatically different the note highway is compared to guitar TAB. For comparison, I loaded up the same song as a Guitar TAB in a program called Guitar Pro and managed to easily play the entire song on the first attempt. This doesn’t mean there’s anything wrong with the game – all it means is that if you’re an experienced player, it will take a while to learn how to sight read music in the game. It’s very different to see the notes come towards you instead of scrolling sideways. After a while, I did manage to get the hang of it and techniques such as bends and vibrato make a lot of sense in the game. So to summarize how easy Rocksmith 2014 is to use: if you’re a beginner on guitar, the note highway will make a lot of sense. You should also find it fairly easy to learn songs thanks to how Rocksmith changes the guitar parts based on your current skill level. If you’re an experienced guitarist, the note highway has a bit of a learning curve if you’re already familiar with guitar TAB. I recommend inverting the fretboard to cut this learning curve down. After you get used to the note highway you won’t have any other problems with the game. The game comes with a ‘Real Tone Cable’ which connects your guitar to your Xbox, PS3, PC/Mac. Unfortunately, if you have a PC/Mac you cannot use any other audio interface you already use to connect your guitar to the game so you need to buy the Real Tone Cable. I tested the game with a few different guitars to see how it would work and the note recognition never had a problem and the tones sound fine. In many of the songs the tones were excellent and suited the songs perfectly. In other songs, the tones were a bit annoying. Some of the distortion based songs sounded too digitized and many sounded over the top. But of course it’s a game so don’t expect recording quality tones! You can also adjust the levels so if you feel your guitar is too buried in the mix you can easily raise it. The way the tones switched throughout the song felt great. As an experienced guitarist, it was strangely exciting to hear the tone switch from clean to distorted without needed to stomp on a pedal. As a beginner, this simply means you can focus on what you are playing instead of worrying about your tone. Fantastic range of songs – The downloadable packs can greatly increase the choices you have and all the songs seem very suitable from a guitarist’s point of view. Beginners and advanced students will have something appropriate to their skill level and you should be able to easily find songs you like in any style. Great experience – Rocksmith 2014 can be thought of as a more refined/serious version of Guitar Hero. The cartoon style players are removed and the focus is on actually learning songs. The way the note highway lights up is enjoyable without being distracting. Excellent learning tool – Rocksmith is packed with lessons so a complete beginner could pick this game up and realistically use it exclusively to learn their first songs. Of course, as a guitar teacher, I know the value of real lessons, but Rocksmith does an excellent job of introducing new techniques and skills at the right time. Alternate tunings – This might seem minor but including songs that use alternate tunings (eg: Drop-D) is a great addition. 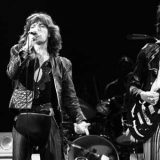 Beginners will want to avoid these songs at first but eventually, you will want to play some songs in alternate tunings. Experienced guitarists might find Rocksmith 2014 frustrating at first as they have basically reinvented the way music is displayed. The note highway is very different to learning music from guitar TAB so you might find it a challenge at first. It can be very frustrating to know that you could easily play a song from guitar TAB when struggling with the note highway. Inverting the fretboard will cut the learning curve down and make it easier to understand. PC/Mac users cannot use their own gear and must purchase the ‘Real Tone Cable’ to play Rocksmith. Fortunately, the tone sounds fine using the Real Tone Cable. While the song selection is fantastic and the downloadable packs greatly extend the number of songs available, if there’s a specific song you want to learn – the odds are it won’t be available on Rocksmith. For example, you won’t find any Metallica songs on Rocksmith any time soon as they are locked into an exclusivity contract with Activision due to releasing the game Guitar Hero: Metallica. Beginners – for beginners wanting to learn guitar, this is actually a very useful learning tool. Although it’s mainly a game, it’s packed full with real lessons and useful tools like the Riff Repeater that will actually help you develop your skills. It’s very possible to learn to play guitar from Rocksmith 2014. I expected a simplified version similar to Guitar Hero and was very surprised with what Rocksmith 2014 really is. If you want to learn guitar or are just getting started, I recommend Rocksmith 2014. 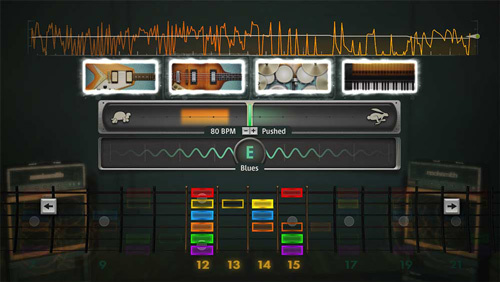 Advanced guitarists – Rocksmith 2014 is focused on teaching people how to play guitar. So if you’re already an accomplished guitarist, a big portion of the game won’t be of any use to you. You will find it annoying having to start with simplified versions of the songs and you may even struggle to read the music at all. It will take longer than you expect to get used to the note highway if you’re already used to guitar TAB. It is fun to jam with the songs so if you already know how to play the songs you can simply jam along without needing to worry about reading the music. But if you want to use Rocksmith 2014 to learn new songs, I recommend you stick to downloading guitar TABs in Guitar Pro. For a beginner Rocksmith 2014 is a great learning tool. For an advanced guitarist, it’s a game. So if you’re looking for a guitar-based game, go for it, but if you’re looking for something to help you continue to develop your skills, Rocksmith 2014 isn’t for you. If you’re new to guitar make sure you go through the lessons and regularly spend time in the Guitarcade. If you only play songs it will take you far longer to learn those songs compared to if you spend time working on techniques and exercises. Spend 5-10 minutes every day in the Guitarcade to develop your techniques and go through the recommended lessons shown for any song you want to learn. Then learn the song in sections using the Riff Repeater. For example spend 5 minutes working on the verse section, then spend 5 minutes working on the chorus section. It might seem like more work in the beginning, but it will greatly reduce the overall time to take to fully learn and memorize a song. I’ll straight up say that Guitar Hero or Rockband aren’t alternatives to Rocksmith 2014. 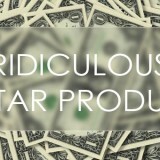 You cannot compare playing a plastic guitar-shaped controller to an actual guitar. At the moment the only close alternative to Rocksmith 2014 (apart from the original Rocksmith) is a game called BandFuse: Rock Legends. BandFuse is an interesting alternative for experienced guitarists as it uses actual guitar TAB on the screen instead of the note highway. I will review this shortly to give a proper comparison. Check out details such as price, availability and more reviews on Rocksmith 2014 here on Amazon.